INDIANAPOLIS — It’s not hard to figure out why the Kansas City Chiefs are crafting a proposal to change the NFL’s playoff overtime rules and guarantee both teams an opportunity to receive the ball. 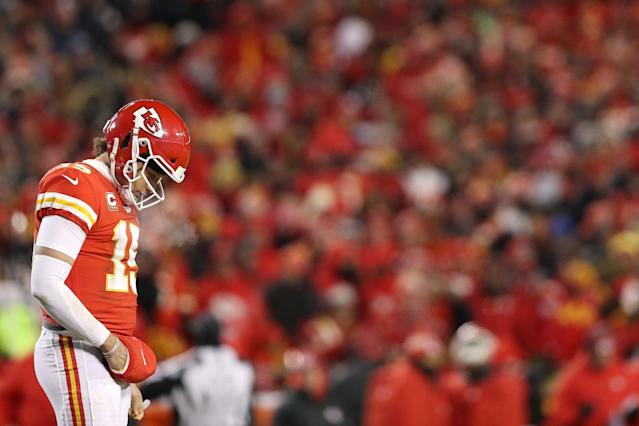 The Chiefs’ season ended in January after they lost the overtime coin-flip and ultimately the AFC title game 37-31 to the New England Patriots, after all. Still, it would be a mistake to assume — as some have — that the Chiefs and coach Andy Reid are undertaking this initiative because they’re sore losers. The truth is, football fans in general stand to gain from a tweak of the rule, the details of which are still being finalized, sources tell Yahoo Sports. As is, the current overtime rules in the playoffs — which allow both teams an opportunity to possess the ball at least once in overtime unless the team that gets it first scores a touchdown — is the reason a dynamite, high-scoring AFC championship came to a quick, unsatisfying end. Not that it was much of a surprise. Because when the Patriots won the coin toss and the G.O.A.T, Tom Brady, took the field against an embattled defense, it was like Michael Jordan vs. anyone, down one with the ball with 10 seconds left: You already knew how this thing would end. But to be clear — and let me really hammer this home — the Chiefs did not lose to the Patriots because of the current rule. After all, the New Orleans Saints won the coin toss in overtime of the NFC championship, and they still lost. As for the Chiefs, the biggest reason for their defeat was their atrocious defense, which couldn’t get a stop on three consecutive third-and-10s … couldn’t stop a collection of dive and old-school power run plays … and was led by a defensive coordinator in Bob Sutton who would soon be fired. And because of this, Reid — who could have pulled the plug on Sutton after last season, when many were calling for it — will have to live with that. There are over 100 plays in a football game, and on practically every one of them, particularly on defense, you can point to a mistake by a Chiefs player that cost them points. So yes, the need for the change is, as a matter of practicality, far about fun more than fairness. That said, Reid’s decision to craft a proposal to change the rule could easily wind up being a positive thing for football fans. I mean, come on. Who outside of New England would not have enjoyed seeing Patrick Mahomes, the eventual league MVP, thrust into the following situation: down seven in overtime of the AFC championship game, with the Chiefs needing a touchdown and, say, a two-point conversion to win? Certainly not the networks, who continue to pour loads of money in the league, and certainly not fans, who love free football when the stakes are highest. What’s more, say the Chiefs had won the coin toss and went down and scored and won. We should still be having this argument because seeing Brady in the same situation as the one outlined above would have been epic. To that end, it will be interesting to see what the details of the Chiefs’ plan entail. In the past, some football fans have proposed going to the college rules, where both teams alternate getting the ball at each team’s 25-yard line until a winner emerges. Others, meanwhile, believe in just letting them play until someone is victorious. My hunch is that the proposal will be an improvement. Not only does the current iteration of the NFL’s overtime playoff rules not go far enough, more than anything, it also isn’t fun enough.